First of all I apologise for the delay of everything on the blog since myself has been busy with college work along with my part time job to balancing plans for myself to get into the university of Chester to do a combined degree within Marketing and Public Relations with Journalism. This week I’ve noticed that the ‘Fabulously British’ brand Jack Wills has been celebrating the Gilet through this week and it will finish on Sunday 29th September 2013. Through the social activities on their twitter and especially their instagram account they have had their audience guessing which iconic location is located whilst, at the end of the week one lucky person regarding each Gilet featured will win depending on what day of location you’ve commented on. Since throughout the week the gilet will be celebrated by Jack Wills and whilst the weather is slightly changing to autumn hues of leaf’s changing etc. I thought it would be appropriate to show you how you work a gilet since a lot of people I know have many questions about the garment. 1. Choose the perfect fit and size of hood which maybe also detachable because, when wearing this through autumn or spring you need to feel comfortable and warm. 2. Dress underneath the gilet your favourite blouses, jumpers and shirts. 3. Teaming your top layer with jeans (dark blue to black to print will do) or even leggings will do. You could you even don a skirt as well. The choice is up to too you. 4. After you’ve got the main outfit perfectly coordinated with the colour of the gilet or the accessories you may put with it such as satchel, beanie hat, loafers, ballerina flats, brogues, or even the good old comfy snow boots (if the weather is that bad of snowy weather). 5. Finally you are done! Enjoy keeping warm and stylish ladies and gents! Paris is up next on the fashion month schedule so expect Dior, Chanel, and Stella McCartney etc. To be available on the international collections section. 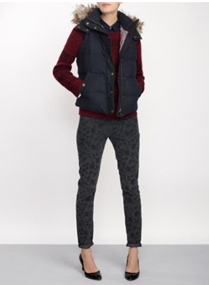 P.S Jack Wills Halifax has got a sale on their men's and ladies Gilets starting from £34. * Terms and Conditions: Price is accurate at the time of this article being published. Therefore please check in store the price of item ahead of purchasing. Thank You.